In our previous Weekly note, we had mentioned that we continue to remain in the 27-month long upward rising channel which is the primary uptrend. We had also expected the gains to get extended in the coming week. 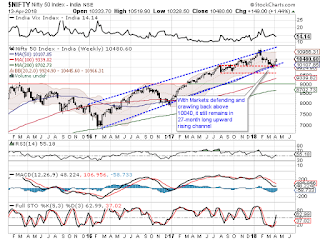 In line with this analysis, the Markets extended its gains in the Week that has gone by. The benchmark Index NIFTY50 ended the week gaining 149 points or 1.44% on weekly basis. Global volatility, which was intense in the previous couple of week, has become somewhat less intense and this is likely to benefit the Markets in the coming week. Though we remain little overstretched on the Daily Charts, we expect the coming week to remain resilient to any major downsides. Some consolidation and ranged volatile moves are likely but we expect the Markets to maintain upward bias despite minor intermittent hiccups that we may see in the coming week. The coming week will see the levels of 10565 and 10690 as immediate resistance levels. Supports come in at 10365 and 10290 zones. The Relative Strength Index – RSI on the Weekly Charts is 55.1793 and it remains neutral showing no divergence against the price. The Weekly MACD has flattened its trajectory and is moving towards reporting a positive crossover. No significant formations were observed on Candles. The pattern analysis shows that the NIFTY has attempted to move past its 20-Week Moving Average. This may bring in some short term momentum in the Markets. This will also keep the consolidation moves, if any, less damaging for the Markets. Overall, there are no signals present on the Charts that may suggest any significant downsides to the Markets. However, NIFTY remains slightly overstretched on the Daily Charts and this may bring in some volatile consolidation. It is important to note that once the Markets are able to navigate itself through some consolidation which seems imminent, it is likely to continue with its up move as the undercurrent continues to remain intact. We reiterate to make use of any corrective bouts that the Markets offer to make select purchases. Sector-specific out performances will be seen. 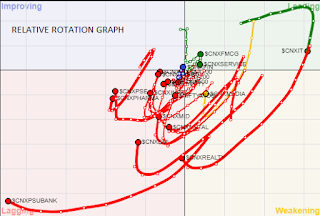 A study of Relative Rotation Graphs – shows though IT pack has continue to relatively outperform the general markets, the evident loss of momentum continues and this should be taken with a caution. Apart from this, we will see Services sector and FMCG pack continuing to relatively out-perform the general markets. Another important thing to notice is the across the board, all broader indices have shown sharp improvement in the relative momentum. Therefore, we will see components of CNX 100, 200, 500, NIFTY Next 50, NIFTY MidCap 50 and 100 pack selectively bettering their performance and relatively out-performing the Markets. This is despite the fact that these pack remain the Lagging Quadrant. No significant performance is expected from REALTY and PSU Banks. ENERGY and AUTO are expected to show scattered out-performances.